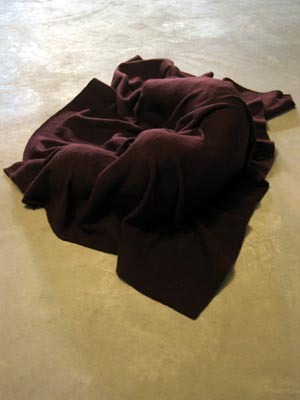 Sculpture of a sleeping figure in foetus shape, underneath a warm brown blanket. The image is a universal one: sleep, birth and death have got the same apparition (people used to be burried in this shape, in round graves, even). In my recurring theme of combining the tragedy as well as the comfort in one sculpture the covering, sheltering blanket is essential. It also creates a tension field between presence and absence, another recurring theme in my work. This sculpture was first exhibited in De Vishal in Haarlem, october 2006.